The recent spate of terrorist attacks in Indonesia, the continuing battle between the military and IS-remnants in southern Philippines, and the thwarting of over one dozen attacks in Malaysia, underscore the continuous terrorist threat from the Islamic State (IS) terrorist group and its worldwide affiliates and associates. This also means that while IS is presently weak at the centre (Levant), it is stronger at the periphery (wilayat or governorates). These attacks are consistent with IS strategy of spreading terror and mayhem during the Islamic month of Ramadan, using its worldwide networks of supporters and sympathisers. Operationally, IS has privatised and urbanised the global terrorist threat to maximise the impact of terrorist attacks and minimise the losses and costs. This is exemplified by the use of families and individuals as perpetrators of terrorist attacks which prevents early detection and fuels the group’s online propaganda. The families involved in the multiple attacks in Indonesia — Church bombing and motorcycle-borne twin suicide attacks on a police check post in Surabaya followed by a sword-and-suicide attack in Pekanbaru, Sumatra on regional police headquarters — belonged to the IS-linked militant group Jamaah Ansharut Daulah (JAD) which was designated a terrorist group by the US State Department in January 2017. The trend of using radicalised families for terrorist attacks is not entirely new. In a recent article, eminent Southeast Asia terrorism expert, Sidney Jones has noted, “IS has always been a family affair where women are the lionesses and children are the cubs of [so-called] Caliphate.” In retrospect, the Paris and San Bernardino attacks in late 2015 were carried out by two brothers (Abdeslam brothers) and a husband-wife-team (Tashfeen Malik and Syed Rizwan Farook) respectively. Similarly, the Charlie Hebdo attack in October 2015 was carried out by two brothers, Saïd and Chérif Kouachi. Likewise, the Boston marathon bombing in 2013 was also the work of two brothers of Kazakh origin, Dzhokhar Tsarnaev and Tamerlan Tsarnaev. Given such familial links, in addition to the search for individual factors for radicalisation, the academic community should also look into kinship and peer-to-peer factors in radicalisation where family members and friends can transpose extremist ideas on an individual, bypassing several stages of radicalisation and motivating them to act out of love, loyalty and trust. The other dimension of these attacks is the urbanisation of terrorist attacks which has been the main feature of global terrorism since 9/11. Cities are not just the targets but also incubators and sanctuaries for terrorist groups. Moreover, attacks in cities are high-impact and generate a lot of ‘favourable’ propaganda for terrorists. Terrorism is propaganda by the deed and by targeting police check posts, places of worships, shopping malls, pedestrians and other public places, IS is gaining ‘revenge’ and making up for the territorial losses in Iraq and Syria. By doing so, it is forcing the home countries to ‘[over] react’ with strict counter-terrorism policies which in turn breeds resentment and fuels more violence It also gives more publicity to IS and creates the impression that despite heavy losses the group remains strong and retains its global outreach. Moreover, in its propaganda literature, IS glorifies these attackers as martyrs, heroes and icons to encourage others to emulate similar tactics. 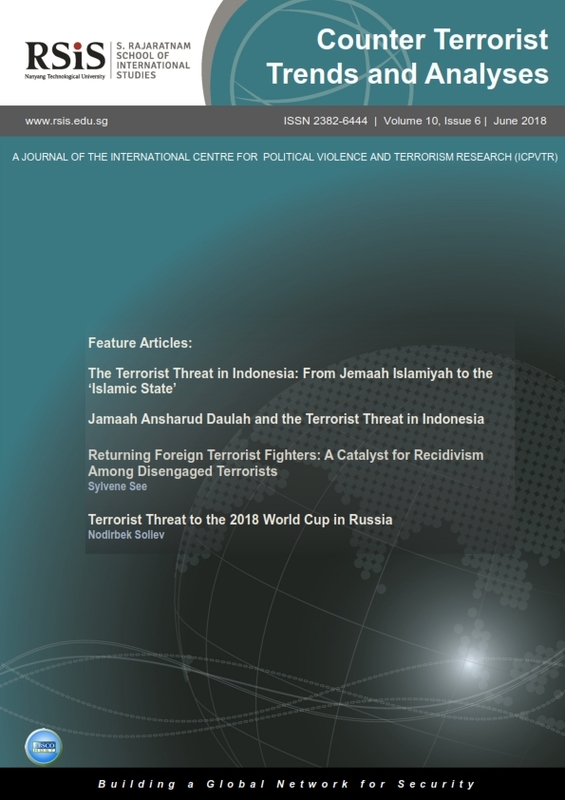 In this issue, two feature articles, discuss different aspects of the terrorist threat in Indonesia, the recent spate of attacks, including the prison siege and the motivations of the JAD detainees. In addition, they also trace the evolution of the terrorist threat in the country from being Jemaah Islamiyah dominated to ‘Islamic State’ focused. The articles titled, The Terrorist Threat in Indonesia: From Jemaah Islamiyah to the ‘Islamic State’ and Jamaah Ansharud Daulah and the Terrorist Threat in Indonesia argue for greater cooperation and collaboration between Southeast Asian states to mitigate the growing domestic terrorist threat. Considering the string of attacks perpetrated by JAD members and supporters, it is evident that IS has not been mortally wounded and has instead morphed into a stronger entity in isolated geographical centres through its affiliates. This points towards a decentralisation of the threat and a need to focus on issues such as proliferation of smaller IS-linked networks and cells, family-based radicalisation and the involvement of children in terrorism. Another dimension of IS growing strength in the periphery is the issue of returning Terrorist Foreign Fighters (FTFs) who pose a clear and present danger to the security of several countries. This has generated an academic and policy debate on how to deal with returning FTFs. The problem is further compounded by the lack of credible data on FTTs. Against this backdrop, Sylvene See’s article sheds light on areas where returning FTFs could leverage strongly-knit pockets of domestic support in various countries to conduct attacks. They could also serve as catalysts for recidivism or reactivation of disengaged terrorists, by playing the role of recruiters, propagandists and trainers. According to the author, these developments could increase the risk of disengaged terrorists re-engaging with their former networks and activities, in comparison to de-radicalised terrorists. Lastly, Nodirbek Soliev focuses on the surge of IS online propaganda threatening attacks on the upcoming World Cup event in Russia from June to July 2018. Russian authorities have stepped up counter-terrorism efforts to thwart attacks targeting civilians, public transportation systems and other locations during and in the run up to the event. The author states that the terrorist threat in Russia could come from three major categories. First, IS’ Wilayah Qawqaz in the North Caucasus has conducted multiple suicide bombings and knife attacks, indicating the group’s ability and intention to target the event. Second, in April 2017, Al-Qaeda-affiliated militants claimed their first attack in Russia, suggesting that Al-Qaeda could seek competition with IS’ local affiliate in the North Caucasus. Lastly, the radicalisation of segments of the Central Asian diaspora highlights the possibility of small-scale lone-wolf attacks targeting the event. It remains critical for Russia to ensure security during the event and maintain local support for involvement in the Syrian civil war.